In Canadian coinage, some of the more interesting varieties - differences within a given coin issue - occurred in connection with the abdication of King Edward VIII. Early in 1936 Edward became king, succeeding his late father, George V. As was the usual practice, the coinage for the remainder of the year continued to bear the effigy of the deceased monarch, but by early December plans for the new Canadian coinage for Edward VIII were at an advanced stage. The model for the obverse had been completed and production of the steel master tools for some denominations had begun. Edward's abdication and the constitutional crisis that resulted from his determination to marry Mrs. Simpson negated all the work done on the obverses. 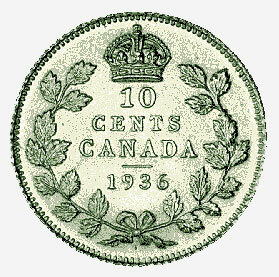 As a result, shortages of one-, ten-and twenty-five cent pieces arose early in 1937 before the coins for the new king, George VI, were ready, forcing Canadian authorities to continue producing coins dated 1936 and bearing the portrait of George V. In order to make these coins distinguishable from those actually produced in 1936, a tiny dot was placed on each of the reverse dies; on the one-cent piece the dot appeared under the date, while on the ten-and twenty-five cent pieces it was placed under the bow on the wreath. Despite the critical shortages that had led to the emergency production of the "dot" coins, it appears that only twenty-five cent pieces were put into circulation. Consequently, the one-and ten-cent pieces are very rare. The coin illustrated is part of the National Currency Collection, Bank of Canada.